This suggests unusually broad and deep exposure to the far-flung University, today and through time--useful preparation for a new Corporation member. Even more useful may be Lee’s familiarity with the workings of the governing boards, the Corporation’s incumbent members, and the president through his work on the search and the joint committee on inspection. Those engagements suggest the swiftest of learning curves at a time when the Corporation is reviewing Harvard governance (see “Self Improvement,” May-June, page 55, and “The Corporation Changes,” March-April, page 52). But most useful of all, at this moment, may be aspects of Lee’s experience and outlook that have no formal connection to Harvard whatsoever. In a conversation at his office in Boston, where he is co-managing partner of the WilmerHale law firm (he earned J.D. and M.B.A. degrees from Cornell in 1976), Lee talked about leading an enterprise with 1,000 attorneys, 2,500 other employees, $1 billion in annual revenues, and offices in 13 locations. Beyond effecting the 2004 merger that created the current organization, he said, WilmerHale has in recent years changed its governance and compensation, extended its domestic and international network, restructured the partner/associate system to create more flexibility and to accommodate two-career families, and even begun revising that most hallowed law-firm custom--moving beyond fees based on hourly billing. That is a lot of change within a tradition-bound profession. Lawyers are not professors, of course, and WilmerHale is not an educational institution, but some of the management principles appear applicable to alma mater’s needs. 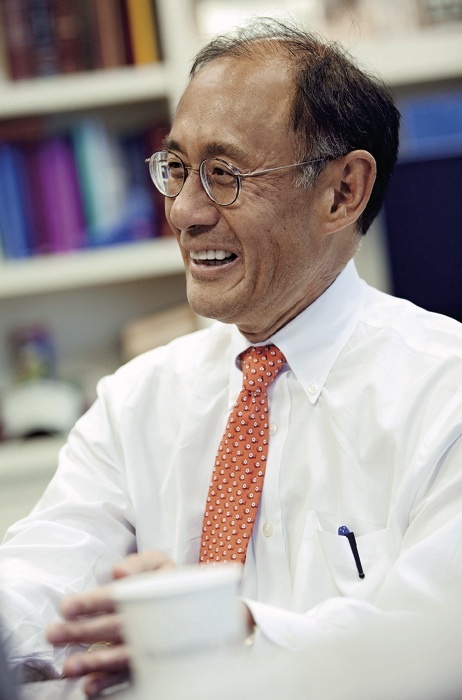 “Harvard is the most innovative, creative place in the world,” Lee said, “and also the most tradition-bound,” leading to conflicts and challenges for leadership and governance. Also pertinent is Lee’s legal expertise. He has specialized in intellectual-property litigation--representing technology firms such as Intel, Apple, Cisco, Broadcom, and Pfizer in patent cases. (The “art” hung on his office wall includes a framed diagram of cellular structure, DNA, and proteins.) That work has led him to appreciate the “relentless” pace of technological change and its “critical” role in shaping the future in general, and therefore the University’s agenda. Hence his interest in SEAS via the visiting committee and, more recently, his membership on the new board of directors of the Broad Institute, the genomics research center initially created as a Harvard-MIT joint venture. (He said that “organizing a board from scratch, without 375 years of history”--as at Harvard--had been “educational.”) The content of Lee’s legal work, and his SEAS and Broad experiences, reinforce the scientific expertise available on the Corporation in a challenging era for sustaining such research. Finally, there is the fact of geography. “I’ve just been around Boston and Cambridge,” he said--a useful vantage point from which to observe and drop in on campus, something that only he and President Faust among current Corporation members are in a position to do readily. “You just hear things.” Lee rattled off Harvard sporting events he regularly attends, a recent lecture by HMS and Harvard School of Public Health professor Atul Gawande he took in, his appointments with deans and professors and administrators, his plans to affiliate with Eliot House and dine with students. Through all his Harvard involvements, Lee said, he has taken deeply to heart a view of its “fundamental mission of research and education for extraordinary young people who come every year.” On behalf of that mission, he was encouraged that during the presidential search, under “challenging circumstances,” the governing boards “performed pretty well” and with appropriate innovations: forming the first faculty advisory committee (“an extraordinarily good experience”) and student advisory committee, and making concerted efforts to reach out to solicit ideas and air concerns. The leadership transitions and more recent financial pressures, Lee said, “cause people to cast a questioning eye on the quality of governance. The Corporation knows that. I know that.” Some of those questions are fundamental: “For a $3-billion enterprise that has all the complexities of Harvard, can a six-person corporation ever be sufficient to tackle all the tasks it has?” Issues like these are being examined now, he said--“a good thing.” And to assure a robust, dynamic future for Harvard, he envisioned the Corporation pursuing an “ongoing process of self-reflection and self-education,” enriched by outside perspectives on how the University could best move forward. On a purely personal level, Lee is gratified that his new Harvard service will not be as confining as his stint on the Board of Overseers. Under an 1846 statute, election as an Overseer forced him to quit teaching at the law school; Corporation members suffer no such constraint.